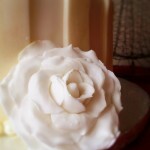 This is the second post in my 6-part How-To on making your own Ivory Striped Wedding Cake with gum paste roses and edible pearls. 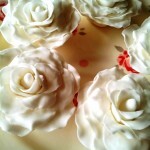 If you plan on making these roses, you will need to do it at least 4 days before you want to use them on your cake. Depending on the size you go for they can take anywhere from 2 to 5 days to dry. If you haven’t already taken a look at Part 1: Tools and Ingredients, have a quick look now to make sure you have all the tools you will need to make these roses. How Do You Make Gum Paste Roses? I’m not even going to attempt to do my own tutorial here. 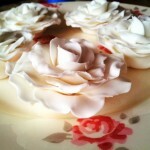 I made my roses using THIS tutorial by Shauna from Balancing Bites. Can I just say that this is a lovely tutorial with beautiful photos. Thank you, Shauna! 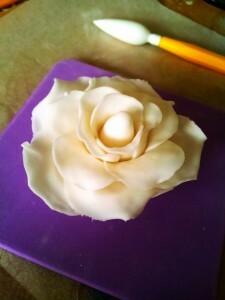 I made 5 large roses (an extra one for in case something went horribly wrong) and 3 small roses. 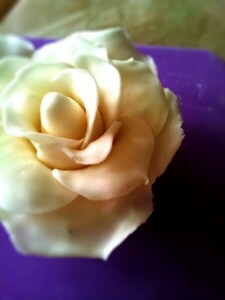 The only difference between Shauna’s roses and mine is that I did not curl my petals with a toothpick. There is something very hypnotic about forming the curls and edges of each lovely petal by hand. If I was aiming for perfect little roses, I would have followed her tutorial to the letter, but I wanted something a bit whimsical and frilly. 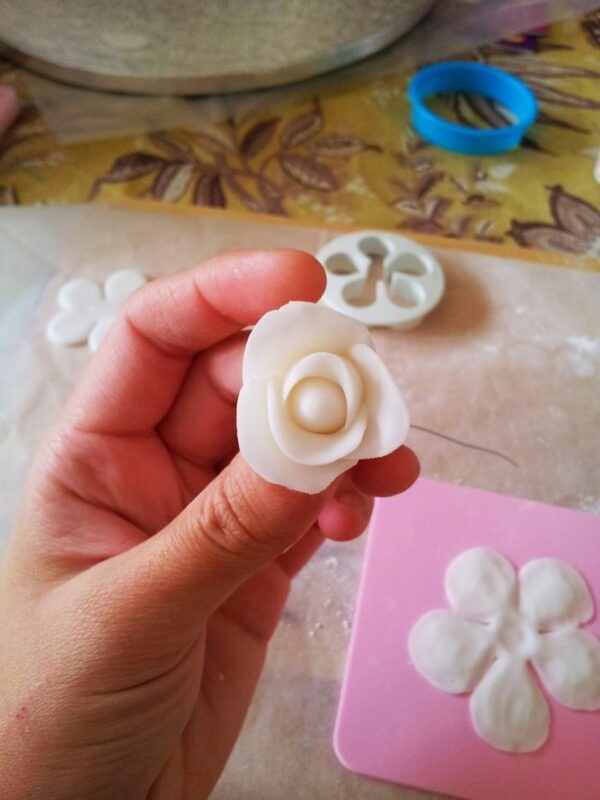 …and one layer with 7 circular petals. To thin out the edges I used this bulbulous cone tool. What a name! I found that I could get thinner edges using the bulbulous tool than I could using the ball tool. 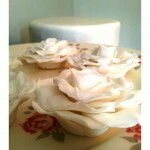 For my small roses I just used 2 layers of petals cut with the rose cutter. I left my roses to dry in little bowls filled with kitchen towel. For the large roses I did not use a wire. This was not by design, but by accident. Clearly I hadn’t let the bulbs dry long enough before making the roses. I hung my second rose up after having added the third layer of petals and barely had time to sit down before I heard a faint “plop”, followed by a slightly louder one. 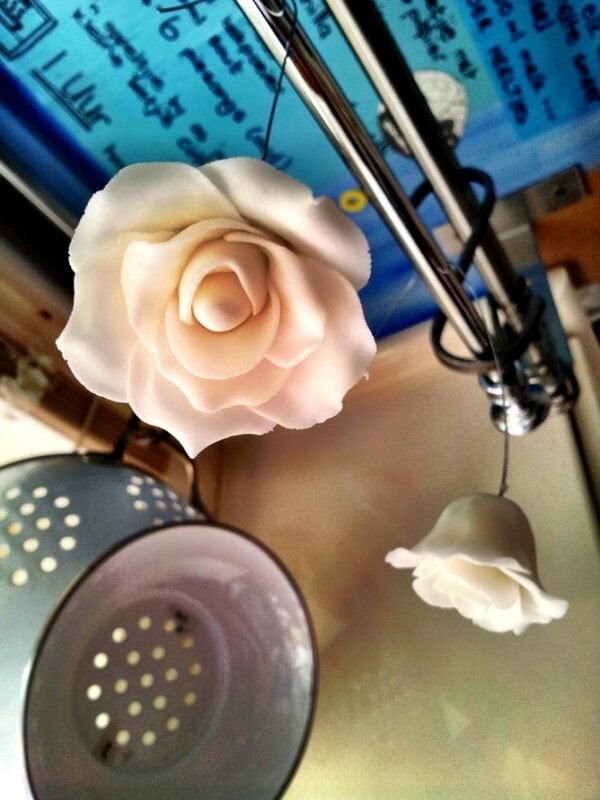 The wires were still hanging, but the roses themselves were lying face-down on my dish rack. 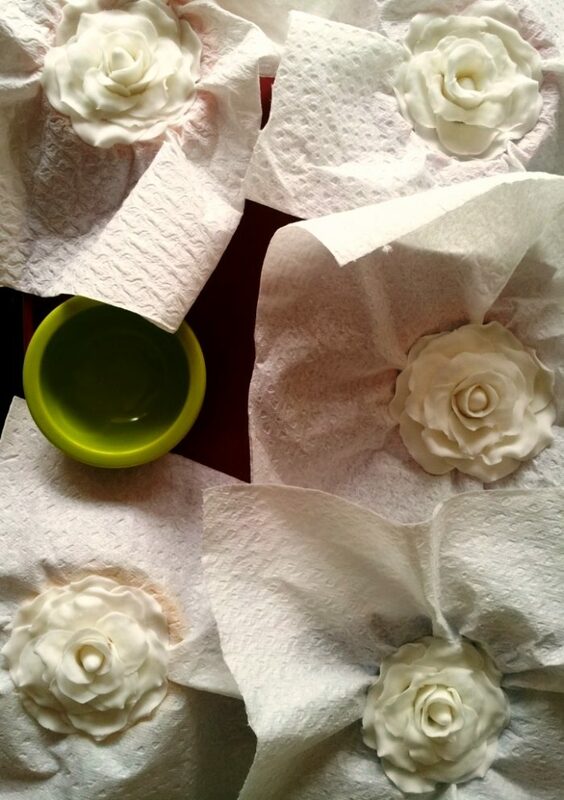 So I removed the wires from all of the roses and placed them in these little bowls between layers and for drying. 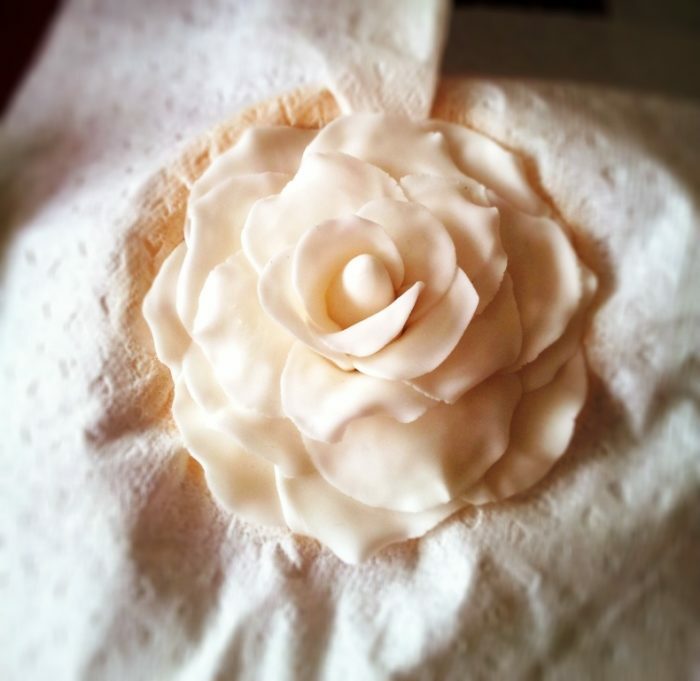 This turned out really well, as I was able to bunch the kitchen towel up in places to help support the shape of my outer layer of petals, so bonus! Moral of the story? Make sure your bulbs dry for at least 12 hours before adding the petals. After 2 days, take them out of the bowls so that their bums can dry. Place them on a drying rack or something similar. If you place them on a flat, non-porous surface they are going to stay slightly pliable – not good! When they are dry, store them in an air-tight container in little kitchen towel nests. And when you take them out on the day of the wedding, give them a little dab of lustre dust to bring out their inner beauty. 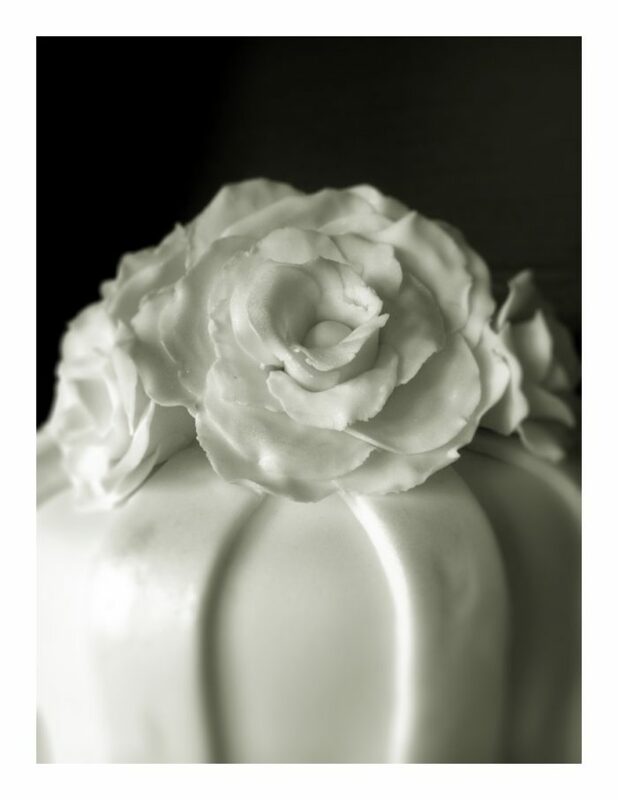 Now that your Gum Paste Roses are made, you can start Baking your Wedding Cake, which I will cover in the next installment of this 6-part series. If you have any questions, feel free to leave a comment and I will get back to you as soon as possible.